As I mentioned in my previous post recapping my trip to Southern California, it was my first time seeing the ocean. It was a beautiful sight and something I did not expect to have such a calming effect on me. Yes, I know pictures of beaches, ocean, and the hum of waves are profoundly calming on a person, but I didn’t actually see it in action until that Friday afternoon in Carlsbad, CA. The ocean is so big, it was almost impossible to grasp. I couldn’t help comparing it to Lake Michigan, which is also very very big, but nothing like this Pacific beach. I wanted to remember my time here. I wanted a souvenir. I saw a bundle of rocks and I picked one up that seemed to be the right size and shape for me. I don’t know why I picked that particular one but I did and I took it with me. The rock has a very smooth surface and it is oval shaped. It’s very pleasant to the touch. Touching and moving it around in my hand gave me a peaceful feeling and I knew this was the perfect souvenir for me. It’s crazy how a simple object like that can also have an effect on us. It’s just a simple piece of rock! But this particular rock has history. It came from somewhere. It has been washed up and over by the ocean waves, again and again. The waves created this texture and surface naturally. The shape was created by itself. The direct contact with nature and the sun and the ocean is what gave this simple rock so much positive calming energy. I wasn’t the only one who thought the rock was special. I showed it to my mom when I came back and as soon as she touched it she said “Oh wow, it is so calming…” and she closed her eyes. I knew it then! This rock is special and I will take care of it. Ever since, I’ve been very careful with it. I don’t want to “demagnetize” it of its energy. I don’t want to put it in any random place, I don’t want it to rub against electronics and lose its serenity. I put it in my bedside drawer on top of a soft cloth to make sure it retains its positive and calming properties. Am I overreacting? Haha, I have no idea. But I have never had an object have such amazing effects on me before. As soon as I touch it – I feel instantly grounded, more calm and peaceful, and positive. It’s amazing. I was thinking if the energy gets lost, I can always go to the park or our beach or something and rub it on the grass or play with it in the water so it can absorb some of that energy too. I hope I don’t sound like a new age hippy. Haha. I’m not crazy, I promise. Do you have an object that calms you down? Do you think I’m nuts or are my thoughts about this rock legit? 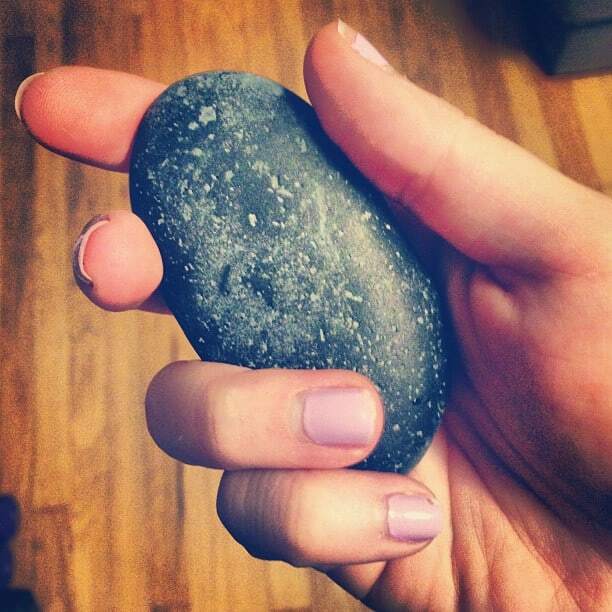 One of my cousins swears that certain stones can have very calming effects and can help clear your mind if you hold it tight! Maybe this is one of them! I loved southern california..was there for the first time back in May. The ocean is so beautiful!! Right?? I totally agree. So peaceful. Where in California did you go? I love staring at the ocean! Something about it’s vastness just makes me feel at peace. As for objects having the ability to calm and comfort-I think it is totally right on! It’s why we all have blankets we live and carry around as kids…or at least I know I had a favorite.